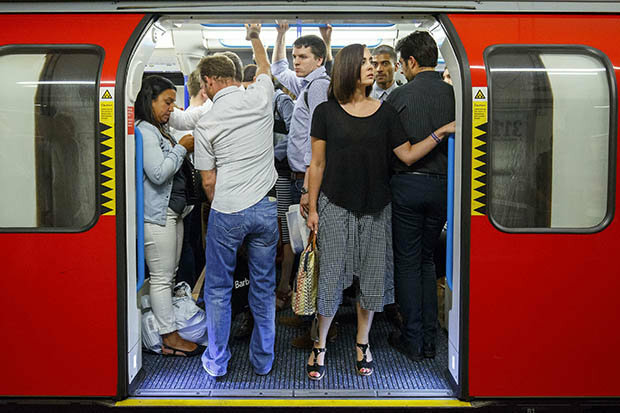 10 things You Need to Know before Riding the Tube in London! Visiting another country can be intimidating if you have never been there before. Maybe you are worried about how you will get from the airport to the hotel and from the hotel to all the fun beautiful tourist destinations. When visiting London, you don’t need to worry a bit. The tube system is VERY easy to use. The people of London are friendly. And most of the city is so walkable, you might only end up using the tube a handful of times! I want to make sure you don’t have to worry about a thing, so I wrote this simple guide of 10 things you need to know before using the tube in London. Comment below if you still have questions or I forgot to cover something! Before I forget, be sure to read my Full Guide to Visiting London! 1. It’s called “the Tube” . Please don’t call it the subway, we are not in New York or Chicago. Don’t call it the Metro, we are not in Paris or Rome. Refer to the Underground system as “the tube” so you sound like you know what your talking about. If you call it the subway you will get a British blank stare. There are few different types of trains included in the system. Each train line is a different color, so it’s SUPER helpful when you are planning your journey and need to switch trains. 2. Which card do I buy? There are so many options for which card to buy and ways to use them. Don’t get confused. If you are a tourist visiting for less than a month, BUY AN OYSTER CARD from a reputable underground window, at the airport, or before you travel online. The easiest thing for me was to buy the card at an Underground TfL (Transport for London) window when I got off the plane. Oyster cards are £5, charge it up with £20 and refill it if you need to. Simple. Every tube stop has electronic stations where you can refill your oyster card before you ride if you run out. 3. Riding through “Zones” . The cost of 1 ride or “journey” will vary depending on if you are traveling far outside the city (to zones 3, 4, 5, etc. ), and if you are riding during typical rush hour Monday through Friday. A single ride can cost as low as £1.50 or up to £4.50 for long journeys. Most all touristy hotels in the center of London and the major tourist attractions are ALL in zones 1-2. So you don’t even need to think about zones. But if you are interested, here is a map of the zones. 4. Tap in & Tap out. When you have your Oyster card ready to go, just walk up to the station platform – tap your card on the YELLOW sensor and walk through. When you have arrived at your destination and are leaving the tube station, you need to tap your card once again on the YELLOW sensor to exit! It helps to have your card handy in an easily accessible pocket so you don’t slow down the droves of people also trying to exit the station. 5. Ask a TfL attendant for help! You will be pleasantly surprised to find that the “Transport for London” employees are SUPER nice and helpful. Anytime that you are not sure which train to take or unsure of how to use the oyster card refill machines, just ASK an attendant. They are waiting for help. The service is wonderful and they can set you in the right direction with a smile! 6. The Right & Left . If you are entering or exiting a station you MUST be aware of the unposted rule of “Right & Left”. When you are on an escalator, the right side is for people who are riding the escalator and simply standing. The left side is for people walking up/down the escalator. If you stand on the left be prepared for some angry travelers who correct you promptly! Trust me, I learned this rule first hand! Never again will I stand on the left side. I promise, London! 7. Most trains are not air-conditioned. 8. Watch out for Priority Seats. If you are using a priority seat and you don’t need it, please be ready to offer it to someone who does. Pregnant or disabled customers can apply for a “badge” to wear when they are riding the tube. The most common one I saw was the “Baby on Board” badge. A few pregnant women were wearing them and no one hesitated to give up their seat to them. Priority seats are for the disabled, elderly and pregnant women. I also witnessed people giving up their seats for women with small children. Priority seats are sometimes a different color and always labeled above them. Watch out for Priority seats and be courteous. 9. Know the name of the last stop. The tube train lines are all labeled in the direction they are headed like “northbound” or “eastbound”. this makes it very easy to understand. But to know if you are headed in the right direction, know the name of the last stop in the direction you need to go. For example to get from Heathrow airport to Hyde Park you will take the “Picadilly Line eastbound towards Cockfosters or Oakwood for 16 stops and then get off on the Hyde Park Corner station”. 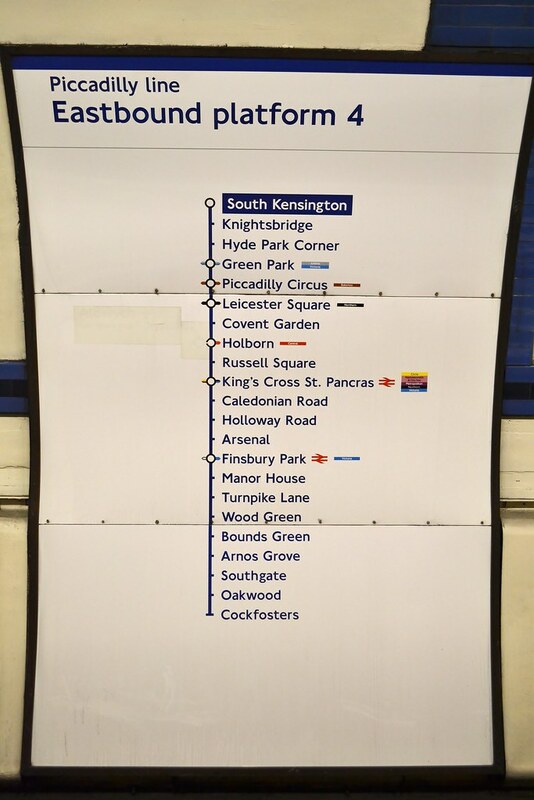 You see, cockfosters or oakwood are names of the last stops if you take the Picadilly line all the way East. Your train will stop 16 times at different stations and then you will get to the Hyde Park Corner and you will get off the train, exit the station (remember to tap out) and then your at your destination, Hyde Park. I hope I simplified this enough for everyone! Comment below if you still have questions. 10. Download a helpful app. I highly recommend that you download the TfL Oyster App or the regular old Google maps app to help you plan your route. IMPORTANT REMINDER: Please remember to place your phone on airplane mode with wifi ON when you are traveling out of your country. (Unless you like huge surprise cell phone bills) I learned this lesson back in 2007 when I went to Ireland and came home to a $600 cell phone bill. There are so many places like Starbucks and restaurants with free wifi. Every hotel will have free wifi. Plan your routes when you have wifi. Remember that Google maps will still show you your location and map even when you are NOT connected to wifi. ADVICE FOR VISITING ANY CITY: If you get lost or confused, go to a free wifi hotspot and use Google Maps app for directions. Put in your current location and destination. Choose the “transit” option instead of “drive” or “walk”. If will give you perfect directions on which tube/train/subway/metro to take and stops, including updated transit closures and such. You can screen shot it and head out to the station! Always be wary of your surrounding. Every big city had pick pockets. Be safe and travel with a companion at night if you can. I hope this post helps you ride the tube with confidence! If you are visiting London and not sure what to see or do, check out my other Blog post, What to See and Do in London! Happy travels!